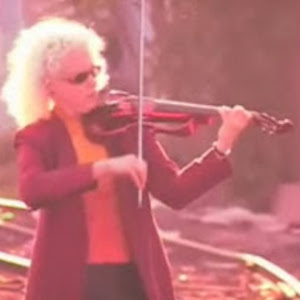 Martha Mooke is a pioneer in the field of the electric five string viola/violin. She has developed a unique musical voice by synthesizing her classical music training with extended techniques, digital effects processing and improvisation. A Yamaha Performing Artist, she is a leading clinician on electric strings. Besides her catalog of works for solo and ensemble electric strings, she has composed music for theater and ballet and served as Music Director for national and international events. On her own and as part of the avant-garde string quartet Scorchio, Martha has toured and performed with such musical luminaries as Barbra Streisand, Peter Gabriel, David Bowie, Philip Glass, Patti Smith, Michael Stipe, David Byrne, Iggy Pop, Regina Spektor, Moby, Lou Reed, Trey Anastasio, Ziggy Marley, Rufus Wainwright, Bon Jovi, Enya, Andrea bocellin, Luciano Pavarotti, Tony Bennett, Al DiMeola, the Orchestra of St. Luke's, and the Kronos Quartet. She has appeared on Regis Live!, the David Letterman Show, The View, Late Night with Conan O’Brien and Rosie O'Donnell shows and currently plays in the Broadway pit orchestras of Wicked and South Pacific.